Often gardeners grow really beautiful plants well, but they don’t look like much. That’s because they’re just randomly plunked in the garden or at look that way. Gardeners don’t think about creating stunning perennial and shrub combinations. Usually it’s because the flowering perennial or shrub lacks a contrasting background that also may enhance the color. I’ve snapped a few photos within the last week from landscapes I’ve designed that illustrate my point. 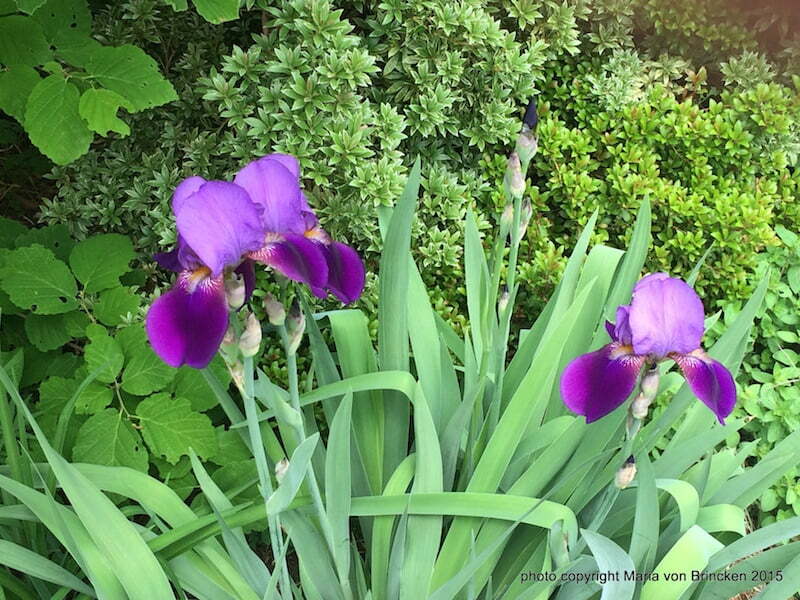 Anyway, the treasured two-tone deep purple and lavender iris pictured came from a friends garden years ago and has been transplanted to my current abode. Every year when it blooms, I’m stopped in my tracks by its’ beauty. Successful pairing with the shrub Pieris ‘Little Heath’ allows the flowers and wonderful blade shaped leaves to be seen. The contrast and the texture of the pieris, and leaves of the shrub hamamelis to the left and perennial Alchemilla mollis to lower right make a stunning combination. Looks good when it’s only foliage too. The second example are the amazingly beautiful peonies blooming in a client’s garden. 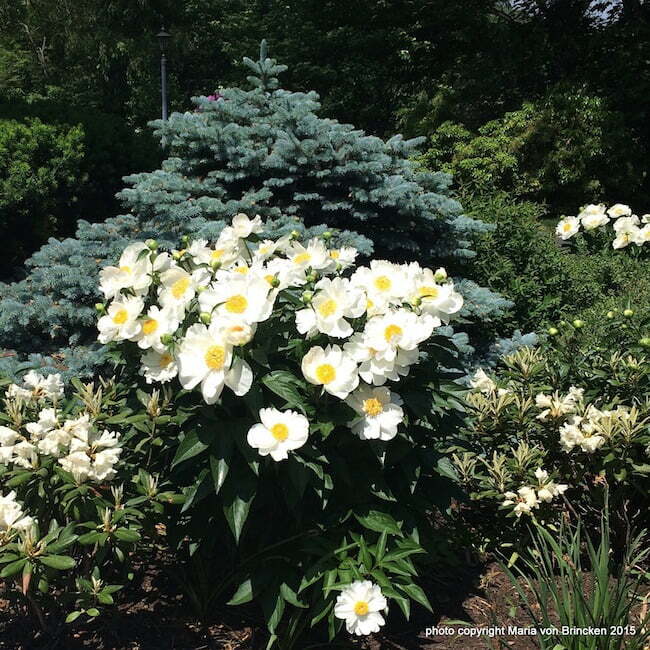 The dwarf blue spruce showcases the Paeonia latiflora ‘White Wings’. The color wheel would tell us that the orange gold of the center is the complimentary color to blue. Paired together, they intensify each other. So we have contrast and color creating this show stopping combination. And in the winter, the spruce plays a leading role in the winter landscape. The third example is the massing of these dwarf ‘yak’ rhododendrons. In this large garden border, if there was only one Rhododendron yakushimanum ‘Princess’, it would be lost. The early pink buds would be could not be enjoyed. Massed plants help us “read” what’s there. 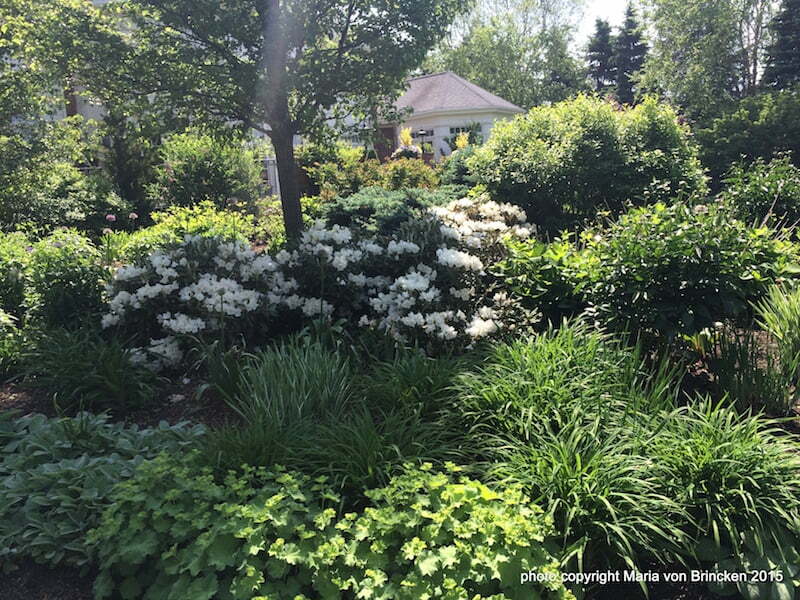 Note the masses foliage of the daylilies and alchemilla in the foreground that make up the composition. Later the green leaves of the yak will support the bright daylily flowers by creating contrast and texture. By the way, in this garden the grouping of three yaks appear three times. From the terrace, you can see them uniting the landscape and creating a feeling of abundance and joy.